At 6:30 a.m. Aug. 12, John Steele got the call no businessman wants to answer. 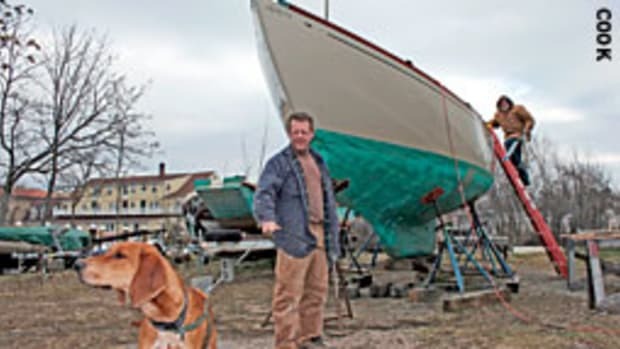 The president of Covey Island Boatworks in Lunenburg, Nova Scotia, was told his boatyard had burned to the ground. To compound the tragedy, one of the gems his yard had produced — the 62-foot gaff-rigged schooner Maggie B, which had recently sailed around the world and was back at the yard for a light refit — was consumed in the blaze. 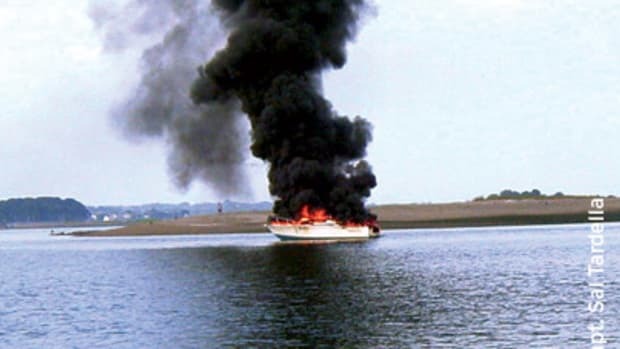 The vessel, the result of decades of dreaming by her owner, was slated to leave the yard Aug. 18, six days after the yard burned. As Steele and his crew began to pick up the pieces, there was hope for his business. It was insured and, at press time, had temporarily moved to other offices in Lunenburg. After evaluating the options, it became clear Covey Island would survive, but there was no replacing Maggie B, the second largest vessel the yard has built. Maggie B was launched Jan. 16, 2006, in Lunenburg with plans already set to undertake a circumnavigation that would start in Bermuda. Over the course of two-and-half years, Maggie B logged some 38,400 miles with 20 crewmembers coming and going on various legs while Blair captained the entire voyage. 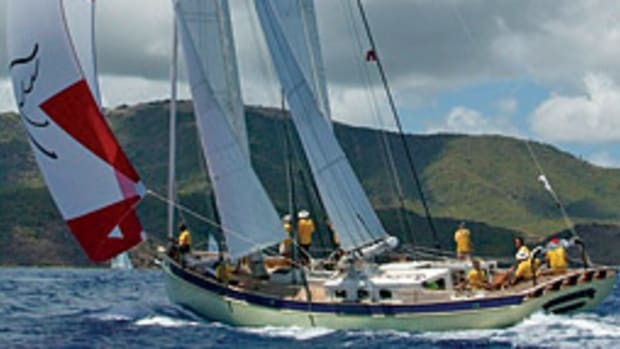 She was designed by Nigel Irens, noted designer for reigning America’s Cup holder Alinghi and of large racing multihulls such as Adventurer, a ground-breaking 115-foot motoryacht and the prototype for Cable & Wireless Adventurer that set a circumnavigation record (74 days, 20 hours, 58 minutes) in 1998; and IDEC 2, the 97-foot trimaran that Francois Joyon sailed solo around the globe to the standing world record (57 days, 13 hours 34 minutes and 6 seconds) set in January. Blair says Maggie B was everything he wanted in a boat. Blair has been an avid sailor his entire life, serving five years in the Navy and teaching sailing on Hurricane Island off the coast of Maine up until his journey on Maggie B. Blair has also been a fighter pilot, worked for a venture capitalist firm, and is now writing a book about his circumnavigation. Blair compares the sessions discussing the plans for Maggie B between Steele and Irens to be something like a jazz trio, where they would “riff” on each other’s ideas. Blair says he also stressed the need to make a boat that could withstand rough seas and conditions. “There’s a difference between sailing a boat and using it as a floating apartment, going from port to port,” says Blair. In June 2004, framing began on Maggie B. About seven figures and 18 months later, she was launched. Blair named her after a book of the same title by Irene Haas that he used to read to his children. The perky toucan that once adorned her jib was the mascot of the boat in the story. Blair says the reason he chose to build a schooner was because he wanted something that would be large and fast. Blair says because he would be sailing in 30 knots, of wind and 10- to 30-foot seas, he wanted a vessel that could stay steady. A hefty forestay supported the large jib, and two sets of runners on the main. The “fusion” of the best of traditional sailing and modern technology came with bronze deadeyes and a hull of recycled Douglas fir and epoxy. Yet the two painted masts were constructed of carbon fiber to cut down on ballast, weight and maintenance. Of course, all of this imagination and craftsmanship is now little more than scrap, to the dismay of not just Blair, but the friends he made along the way during his two-plus years at sea, many of whom served as crew. Blair makes note of some of the reactions from people all over the globe when they heard about Maggie B. Particularly poignant were the comments of Blair’s son, Alden, who crewed with Blair around Cape Horn. One 14-year-old from Nova Scotia noted that Maggie B took her all over the world through her computer, by following her journey over the course of more than two years. At Covey Island, Steele says they will continue to look for a permanent location for their offices and would soon begin work on another 65-foot schooner. However, many items, such as photos, award plaques, scale models and antique tools will never be replaced. As for Blair, he says the thought of rebuilding Maggie is like asking a man at his wife’s funeral if he will remarry. Blair says his fondest memory of Maggie B will be how she performed on the long stretches of the circumnavigation, particularly from Tahiti to Chile. He recalls her top speed in the two years living aboard was 17.6 knots.